This post follows the theme of my last post “Facilitation begins with you” understanding yourself and your style when facilitating. In the last blog I focused on VARK as a model this time I start personality types. I like to use the Myers Briggs Personality Type Indicator (MBTI). It is more complicated than many other simple types with only four quadrants however it provides a more in-depth understanding – particularly if like me you don’t fit easily into one of the quadrants. I am an INTJ – in simple terms an introvert, big picture, logical and organised person. What do I need to consider as a facilitator when working with different types? As an introvert I need some time out to rebuild my energy levels. Lots of interaction can be tiring to an introvert as compared to an extravert who gains energy from other people. When I’m facilitating I see this as an opportunity to practice being my opposite and many people in the group are often surprised to find out my type. To manage this I need to give myself time out if possible in the breaks and especially at the end of the day if the workshop is for two days. I don’t facilitate for more than 2 days in a row and I make sure I get plenty of rest between workshops. Co-facilitating works well for me as it gives some break time during the workshop to build up my energy. Introverts also like to think before they speak – this can be challenging when you are the deliverer and another reason while I prefer a facilitative approach compared to deliverer. As the facilitator I draw on the experiences of the individuals in the group to answer questions from the floor – “What do members of the group think about that?” is a great way to deflect the question, buy some thinking time and draw on all of the vast experiences of the adults in the room. Keep in mind the “think before speak” and provide time for the introverts to think about answers before group input – they prefer not to be put on the spot unless it’s a topic they are knowledgable about. 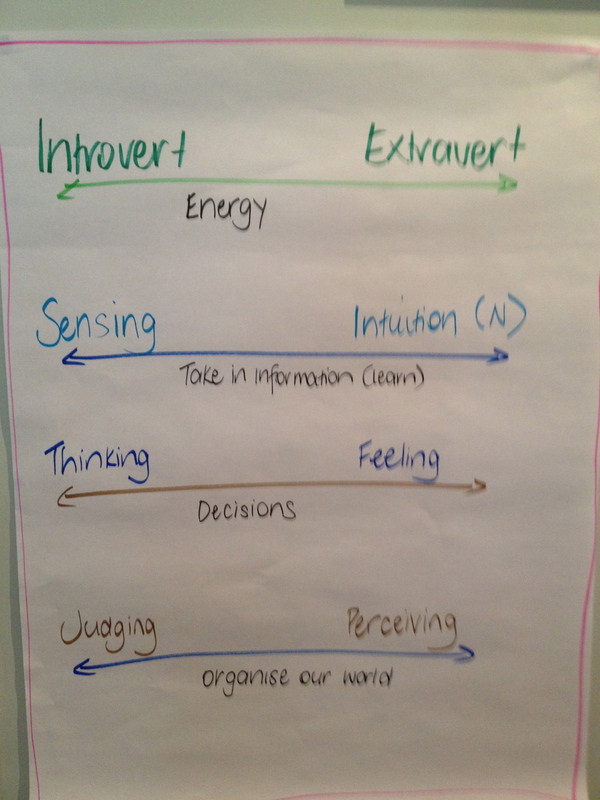 My next blog will focus on the S/N (detail vs big picture) dichotomy in MBTI. Please feel free to share my blog with your colleagues and friends and provide me with any feedback – it’s the best way to learn! Have you ever been to a workshop with a mate only to find what you thought was a fabulous presentation they found difficult to follow and were disengaged? As a facilitator have you ever spent time really analyzing yourself? Do we fall into the pattern of believing everyone likes to learn like we do? Time spent understanding ourselves is not only valuable for us it’s extremely important in making sure we engage our audience more completely. There are lots of frameworks which can be used – we use these in our planning but have we really applied them to ourselves and how this plays out as we facilitate. One of the frameworks I like to use is VARK – Visual, Auditory, Read-write, Kinaesthetic, if you visit www.vark-learn.com you can complete a simple on line questionnaire to determine your preferences. There are also great resources on this website you can download and consider for your workshops. I am a very visual leaner and use lots of visual aids in my presentations – coloured markers, pictures and posters. 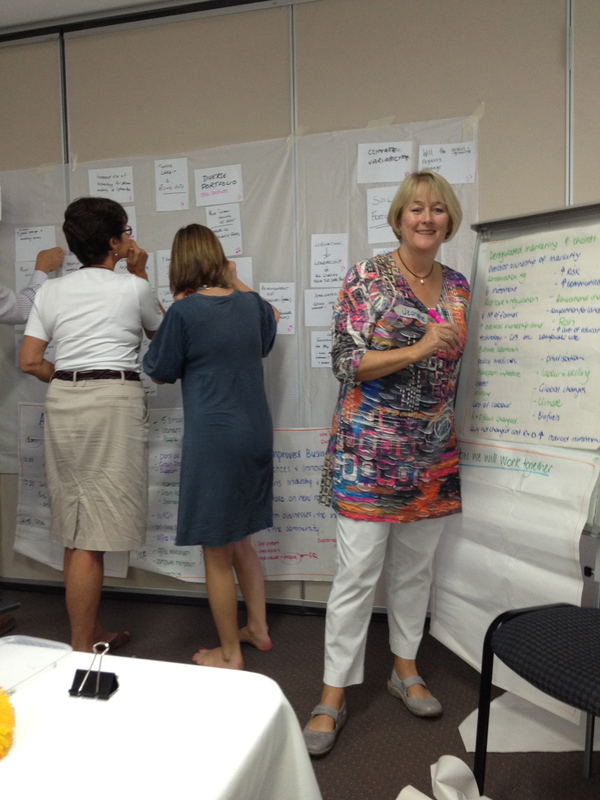 I enjoy some creativity and seeing flip charts developed throughout the workshop as a preference to power point. My lowest score is auditory and I find auditory presenters who get up and speak with no visual aids or notes very difficult to concentrate on – I remember in pictures not words. Unless I take lots of notes I don’t retain much of their presentation. Auditory learners enjoy story telling and if stories are told with visual clues this will help me learn. Read -write preferences have told me about the importance of the notes and hand outs at the workshop. They like detail in the notes and spaces to write their own thoughts and observations or add to the detail provided. For me this has been something I have needed to focus on developing, I would provide brief notes with lots of space for people to write their own ideas and have been told this is not enough for many with this preference. Kinaesthetic learners like to be doing something. They need to be actively engaged in their learning – build in activities and time to practice new skills in a safe environment. Consider how you react to activities and the types of activities in workshops – for example I hate role plays and dislike being “put on the spot”, however am quite comfortable with small group activities and reporting back. Consider your preferences and how this might impact on your style – what areas do you need to focus on more to capture all types? I will continue this theme in future blogs looking more at the role of the facilitator and understanding styles and impacts.